Extra Mile Media + Events is the brainchild of Steve Cram and Allison Curbishley. Two individuals with a wealth of experience in the world of Sport, Media and Event organisation and delivery. Steve is one of the UK’s most well known sporting individuals. As an athlete his career was forged alongside Coe and Ovett to form a period of unprecedented success in British athletics and since retiring has become one of the BBC’s most respected commentators. In a career spanning over three decades, since appearing as a 17 year old at the Commonwealth Games in 1978, Steve’s many achievements include six Gold medals at the Commonwealth Games and the European and World Championships. 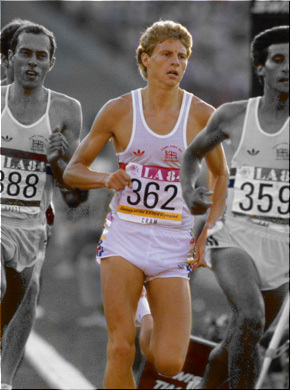 At the 1984 Olympic Games held in Los Angeles he took a Silver medal in the 1500m behind Sebastian Coe. The following year he broke World records in the 1500m, 2000m and Mile,all within 19 days; the latter lasting almost 9 years. Since retiring from competitive athletics Steve has become a very successful television commentator, first with Eurosport and then with Channel 4 before joining the BBC as the Chief Athletics Commentator. Steve has co-presented the 2000 Sydney Olympics, the 2002 Winter Olympics in Salt Lake City, Athens in 2004 where his commentary of Kelly Holmes’ victories will always be well remembered and more recently both the Olympic and Paralympic Games in Beijing as well as the Winter Olympics in Vancouver. Away from the track and the commentating Steve is also Chairman of the English Institute of Sport, which is a nationwide network of sport science and sports medical support services, designed to foster the talents of our elite athletes in all sports. A huge part of Steve’s life is also COCO, a children’s charity he co-founded in 2000 with Jim Panton. COCO has raised well over 1 million pounds in the last decade and continues to help thousands of children enjoy the opportunity to receive an education and change their lives for the better. Allison is a former international athlete and Olympian. She brings a wealth of sporting knowledge and experience to Extra Mile Media & Events as well as a mountain of enthusiasm. Allison is a former international athlete and Olympian. She brings a wealth of sporting knowledge and experience to Extra Mile Media & Events as well as a mountain of enthusiasm. Her own athletics career was curtailed by injury after taking medals at European, Commonwealth and World level. In 2003 following retirement she began working with BBC Five Live radio as their athletics summariser and still to this day forms part of a strong team reporting on the world of track and field, namely ‘how fast can Usain Bolt really go?’ Allison’s appetite for events was borne out of working closely with COCO since 2003 in a fundraising capacity, helping develop their corporate contacts and donors as well as launching and growing the highly respected ‘Steve Cram Celebrity Golf day’. 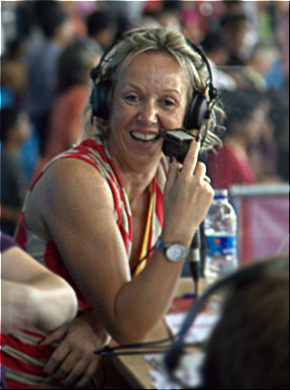 Aside from event organisation, Allison has worked in all areas of the sports media as well as providing services as event MC for the Netball World Series tournament in Liverpool 2010. Her love of sport is at the heart of everything she does and Extra Mile Media and Events reiterates this.